Well, my Monday started off normally and went super fantastic as the day was ending. Why is my week starting off nicely? 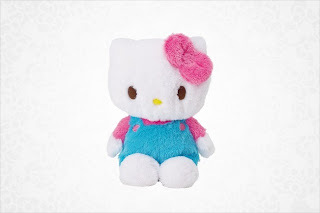 For one thing, I just got enough $ to buy my 18" Hello Kitty plush that has been on my wishlist for awhile now. ^ It took three Sanrio store locations to find this blue version because the nearest store had only the pink version. Definitely a keeper. Saved me the $10 shipping fee if I had bought it from USA Sanrio's online store. Will post a picture of my 18" and 5" versions tomorrow or by Wednesday. Another thing that made the day even more excellent was the fact that I received a vintage item in the mail, which I was surprised to get it so quickly - especially since I'm counting the days and seconds till when my Momoberry plushie arrives with it's cylinder Momoberry box. *Irksome* It still hasn't arrived yet! 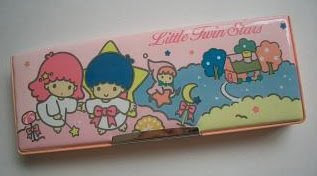 ^ I was expecting some major flaws with this pencil case, but I am really pleased to learn that this vintage piece is definitely a mint version FOR it's age! Very clean all around. I'll post pictures by this week or by Monday the latest. And get this, I am planning to give myself something really Sanrio sweet. It's a "oh my gawd, you're crazy, Sanrio Addict," for sure reaction! I'm working on the details, but I'll reveal them later (3 weeks maybe?)... hehe.